Dr. Robert Ballard, the man who discovered the Titanic wreckage in 1985, appears to be in a race to discover the most stuff. At 74 years old, he doesn’t appear to be slowing down either. His most recent expedition yielded some very peculiar findings. This summer, his ship —the Nautilus — set sail off the coast of the Western U.S. to investigate “methane seeps.” Seeps along the ocean floor are places where gasses (such as methane) bubble up, though it is unknown how much of the gas reaches the surface. Methane seeps were thought to be rare until Ballard’s expedition discovered 500 of them in the Pacific close to the Western U.S. “It appears that the entire coast off of Washington, Oregon and California is a giant methane seep,” said Ballard. He was quick to point out we don’t yet know what this means, other than it warrants more investigation. “At first people thought they were incredibly rare. Now, thanks to these expeditions, these seeps may be very widespread, so the [methane] budgets may have to be recalculated. That’s why the exploration is important,” stated professor Jesse Ausubel, a member of the Nautilus team. The team combed the sea floor with cameras and discovered far more than just the methane seeps — not that those aren’t an important discovery. The team also found an odd array of creatures, some of whom may prove to be species previously unknown to science. Also, they all appear to be purple in color. It is unclear if the species are always purple or if the researchers happened upon them during a themed get-together (it could easily have just been a Prince party). In the video, you can hear the researchers laugh and joke about how fake looking the creature appears to be. It does seem as though someone has stuck “googly eyes” on a toy and dropped it into the ocean. One researcher believes this creature to be a cuttlefish, which are closely related to squids and octopuses. Researchers were stumped as to what this purple orb was. They attempted to retrieve it before a giant crab did. After sampling, on-shore scientists now believe it might be a pleurobranch, which is a type of sea slug, though it could also be a creature new to science. Further testing revealed it was not a “purple disco ball” as one researcher initially believed. The vampire squid is a rare find, as they live only in lightless areas located deep in the ocean. You have to go down at least 2,000 feet before you find any of these squids. Not much is known about this species, however, as their habitat’s location makes study difficult. Additionally, the team also found purple sea cucumbers, what they referred to as purple “mud monsters.” Not exactly the most scientific names, but it sure does sound like the team had fun discovering them. There’s no speculation as to why so many of the creatures in the area were purple, leaving the Prince-themed party as the leading theory by default. The expedition this summer by Dr. Ballard’s team is just the latest in what appears to be a lifetime of discovery. There is possibly nobody in the world who has explored as much as Dr. Ballard has. He has credited reading the book 20,000 Leagues Under the Sea as being the catalyst to his underwater curiosity. He grew up by the beach in San Diego and later served as an officer in the Navy. Since retiring, he has focussed simply on making discoveries. He helped discover the wreckage of the Titanic in 1985 and the lost German Battleship “Bismark” in 1989. In 2002 he found John F. Kennedy’s Motor Torpedo Boat, which was sunk in the Solomon Islands during World War II. In 2003, he founded the Center for Ocean Exploration and Archaeological Oceanography at the University of Rhode Island. Sometimes the most important lesson that science teaches us is that we actually know very little about the world around us. Consider that the world is 70 percent ocean, and we have only explored five percent of it. We haven’t even been to most of the world’s oceans. You have to wonder what googly eyed purple creatures might exist within that other 95 percent. The recent discoveries of Ballard’s team prove that when we go to new places, we discover new things. Luckily, we still have a lot of new places to go. 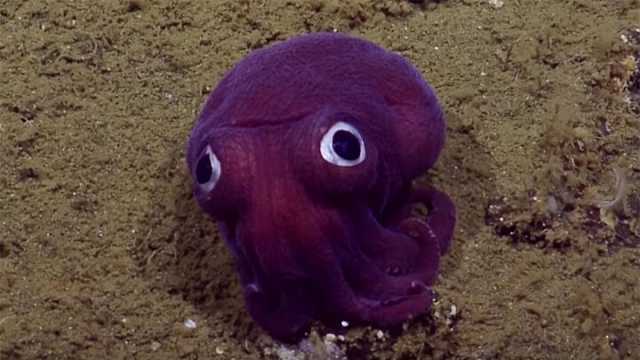 Hey Buddy!, I found this information for you: "Researchers Discover A Purple Sea Creature Party". Here is the website link: https://www.thealternativedaily.com/researchers-discover-purple-sea-creatures/. Thank you.